Guatemala's President Jimmy Morales has been condemned for his order to expel the head of the UN's anti-corruption mission in the country. The US ambassador to the UN, Nikki Haley, said the decision to expel Iván Velásquez was profoundly worrying. Guatemalan prosecutors have accused Mr Morales of funding irregularities in the 2015 election. The UN has backed calls for the removal of Mr Morales' immunity so he can be investigated. Ms Haley said that Iván Velásquez had the "total support" of the US. "As the head of the United Nation's International Commission Against Impunity (CICIG), Velásquez is an essential voice in calls against corruption" she said. Mr Morales has said he ordered Mr Velásquez's expulsion on the grounds he had "meddled in domestic affairs that are the sole responsibility of the Guatemalan state". The decision to expel Mr Velásquez has created a crisis in the country, with at least eight high-level government officials resigning and two being sacked. The move was temporarily halted by the Constitutional Court in Guatemala but Mr Morales said it did not have the power to overrule his decisions on foreign affairs. Adding to the pressure on Mr Velásquez, the European Union said that the expulsion order "put at risk all the work by CICIG to strengthen the law". 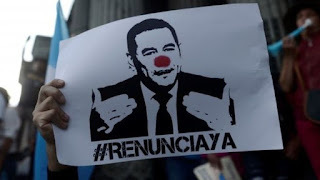 There have also been street protests with demonstrators demanding Mr Morales' resignation.